– Each session of the training course will cover items from the RYA syllabus. If you miss sessions then you will miss subjects. You may be given chance to recover subjects at the end of the course. You will need to have covered almost all subjects to receive all your awards, though your general sailing standard will be taken into account. – You will need to provide a well fitting wetsuit, wet boots and something to wear under and over your wetsuit. Helly Hanson/Tog24 thermal underwear are excellent and synthetic fleece excellent for on top. Adults will also need a waterproof spray top. – You will need to regularly wash your wetsuit/wetboots in Dettol to kill bacteria. – These are to prevent you banging your head too much whilst you learn to duck under the boom, which is hard metal. Once you have reached RYA stage 4 this is optional. – Only go sailing when there is a rescue boat on the water. – Don’t go sailing if you know that it is so windy you will capsize. – If you capsize always stay with your boat. – Use a masthead buoyancy bottle to avoid your mast getting stuck in the mud at the bottom of the lake. – If you see someone in difficulty sail to them, pick them up and bring them to the club. – You are requested to bring a packed lunch for any training course. – Tea/coffee and cordial are provided free of charge. – Do not buy a boat until you have completed your training course. – Talk to the training staff about type of boat to buy and what to watch out for. – You will be encouraged to buy a boat for your second season as club boats are mainly used for training. – The best choice and best prices when buying are in the Autumn. 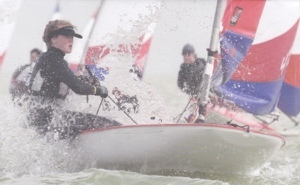 – For youths the RYA has a recommended pathway from Toppers To Laser Radial to full rigged Laser. – Lasers are an excellent choice for adults as they represent good value, there are two rig sizes to suit different wind conditions and there is plenty of competition.